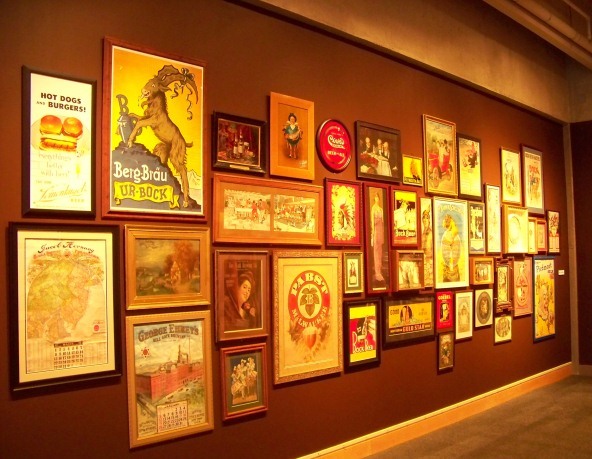 The Grand Rapids Public museum exhibit "Thank You BEER!" gives a quick history of brewing (including brewing in Grand Rapids on the second floor), shows the basics of making beer, and displays an impressive collection of beer cans and beer bottles. Presented in the Meijer Theater is the Discovery presentation "How Beer Saved the World", an hour long beer documentary that is both entertaining and informative. In just a few minutes I learned that acorns were used to brew beer in Colonial American, and that the national anthem is an old beer drinking song with new words. Additionally beer tastings are provided on Thursday evenings and Saturdays, as well as a series of five Thursday evening classes about beer. 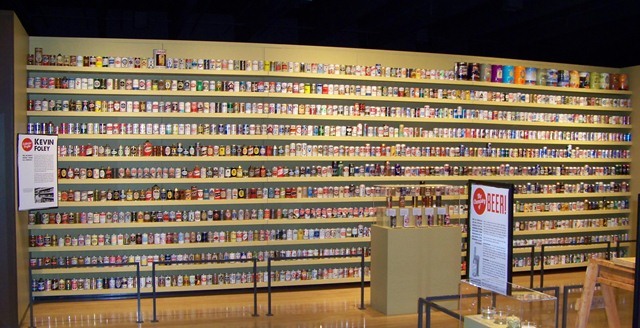 While the overall display was small, it was nice to see the public museum taking an interest in beer. The exhibit featured a ghetto homebrewing setup from Brain Dews of Rockford Brewing. The museum display referred to it as an 'advanced' homebrew setup, this is not exactly the word I would have used to describe it. 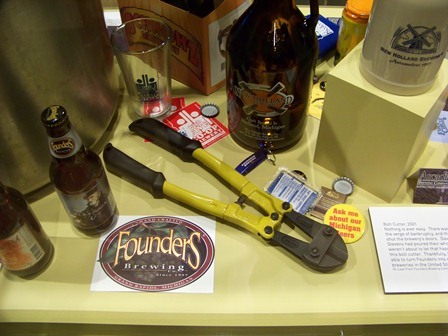 There was a small glass case with the original Founders Bolt cutters, along with assorted local swag. Many of the local breweries were well represented. Nostalgic TV and print ads for beer over the years were displayed along with food pairing and beer '101' facts. Founders Furniture City Stock Ale was featured as well as sold at the gift shop along with beer glasses, shirts, bottle openers, beer cozies, and a book. It is cool that the city of Grand Rapids allows the tastings and alcohol sales at the museum. I have to give the museum, and the city of Grand Rapids, a lot of credit for the exhibit. While overall pretty small and spartan, the vast can collection, and Grand Rapids brewery bottle collection made it well worth the visit. It will be interesting to see how the craft beer world plays out over the next few years. I think Grand Rapids well represents the craft movement. From accomplished brewers and world class breweries to bad hombrewers who want to start a brewery and serve their cloudy beer, we have it all. I predict that all the crappy and so-so breweries will go under (yeah we have some) and the stellar ones with world-class beer are here to stay. In the end weathering the storm that is soon to hit craft breweries will come down to the quality of their product. Here is to good beer! This page contains a single entry by Brewmaster published on November 24, 2012 4:33 PM. Michigan Winter Brewfest Tickets for 2013 was the previous entry in this blog. Lazy Magnolia - Timber Beast is the next entry in this blog.